Theoretical physicist. Novelist. Professor of both science and humanities. 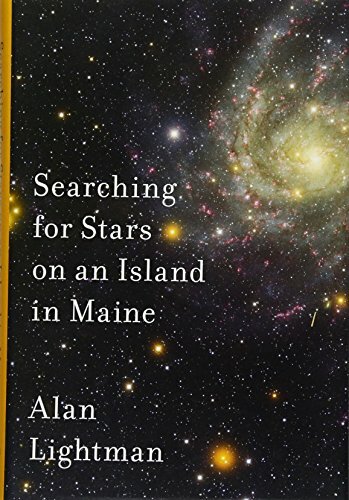 These are the biographical bona fides of Alan Lightman, author of National Book Award Finalist novel “Einstein’s Dreams.” But the author of Searching for Stars on an Island in Maine is also profoundly human, and questions of the eternal, the immutable, the transcendent, dwell in his mind as they do in the minds of most people. Searching for Stars is a deeply personal book. Lightman considers questions of faith and eternity from the perspective of a scientist, but also from the perspective of a man entering his later years. Science answers many questions for us, but certain ultimate questions cannot be empirically answered or experimentally tested. Lightman recounts conversations with persons of faith: Buddhist, Christian, Jewish, Muslim. He looks at sacred texts from those faiths. I cannot say he finds the answers he is looking for, but the process of asking the questions is intimate and compelling. One answer Lightman does find is that science itself is an act of faith. Every faith holds central a series of absolutes: doctrines and credos which may not be provable but are inseparable from the faith itself. For example, Jesus cannot be removed from Christianity. You can have faith, you can even share many of the tenets of Christianity, but without Jesus you have something other, something different from Christianity. Science also has absolutes. One of those is that natural laws always work. If they don’t work, they are not laws. Gravity is always gravity. It always works. It doesn’t take days off, it doesn’t work on earth but not on Alpha Centauri. Because natural laws always work, they allow us to predict natural behaviors. Planetary orbits can be determined mathematically because gravity is a constant. Alterations in orbits indicate other factors at play, such as the presence of moons, another planet, or quantum forces. When those other factors are accounted for, measurements confirm predictions. The law is the law. Ultimately, though, we cannot “prove” that natural laws always work. It is possible, if only as an intellectual exercise, that somewhere in the universe is a place that does not obey the laws of gravity. Or those laws work every day of the week except Tuesday. But it is impossible to account for such a place, because every measurement we have, every theory we hold, every experiment we run, every observation we make both confirms natural law to work AND relies upon it working. We cannot escape the framework in which natural laws work without them no longer working. Thus, at the core of science, is an absolute that cannot be proven or disproven, but must rely upon faith. If science itself is built upon a core belief, what implication does that have upon other articles of faith? Perhaps none. But Lightman speculates that perhaps scientists should employ a little more humility than some do when it regards areas of faith. Lightman’s musings on meaning touched me deeply. He wonders whether impermanence is equal to irrelevance, a question I suspect every person asks as she or he ages. Has my life mattered? What defines this? Will I be remembered? If a civilization of ants lasted for 100 years, built an amazing city full of beautiful architecture, stunning works of art, literature, philosophy, then was completely wiped out by a storm leaving no trace of their existence, did they “matter”? Those are not questions science can answer, and Lightman knows this. Meaning and purpose cannot be measured or calculated. Each person will have to search for those stars in their own personal quest. Searching for Stars is a beautiful, unexpected book. I can’t say Lightman found everything he was looking for. But sharing his journey with us is a gift, one that can encourage us all to explore those questions with every tool available to us.